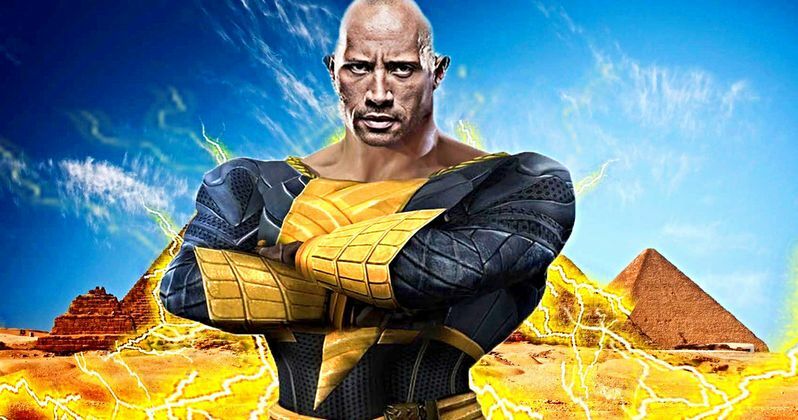 Despite the fact that the character is not going to be featured in next year's Shazam, Dwayne Johnson is still going to play Black Adam in the DC universe and the character's solo movie is definitely happening. This, according to producer Hiram Garcia, who is one of the key people over at Johnson's Seven Bucks Productions and is the wrestler-turned-actor's longtime producing partner. Garcia recently provided a pretty substantial update about the project and assures fans that the movie is still coming and is well on its way to becoming a reality. Here's what he had to say about it in a recent interview. "Black Adam is definitely happening. We're actually very deep into a script on it right now, which is coming along really well. I'm really excited with the story we've crafted. Look, I've always been a huge comic book fan. I've always had this dream, I've always wanted to, You know, you kind of have like these goals of like, 'One day I'd love to be able to do this and this,' and making a superhero movie was definitely always one of my dreams. For the longest time, you know you kind of have this living superhero in Dwayne Johnson, so I was always trying to figure out what's the perfect character that will kind of fit him and his look and his build and his kind of edge and the attitude he's got." Dwayne Johnson has been attached to the role for some time and the original plan was to include Black Adam as the villain in Shazam, which stars Zachary Levi as the titular hero. At one point, things changed and a plan was hatched to split things up and to give Black Adam his own movie before having him meet up with Shazam. Hiram Garcia also elaborated on why that decision came to be in the first place. "So as we were developing an actual Black Adam and Shazam movie, we were just realizing that both characters are so special that we didn't want to compromise either of them by cramming them both into the same movie. So that's why we made the decision to let Shazam have his own standalone movie and kind of launch him properly, and then we'll do the same for Black Adam. And so that kind of really freed things up. It allowed us to develop the right version of both." Justice League ultimately failed to meet Warner Bros.' expectations for it last year and that forced the studio to rethink their strategy with DC moving forward. They had been developing projects left and right. No doubt, at least a few of those are going to wind up being scrapped as a result of this new strategy. With Dwayne Johnson becoming increasingly and unrelentingly busy as one of Hollywood's most in-demand stars, it wasn't hard to imagine that the Black Adam movie may have been one of those projects. On the contrary, it sounds like things are moving right along. "So where we are now with Black Adam is we just got our latest script [from Adam Sztykiel]. We're doing some revisions on it. We're extremely excited about it, the studio's very excited about it. And I'm telling you man, as a comic book fan, when this thing comes out, it is going to be amazing (laughs). This is the fanboy in me talking to you, it's going to deliver on the goods of everything you'd want to see Black Adam do, he's going to be doing in this film. Especially when he's not a boy scout. Especially when he's got edge to him. Like, he's not the boy scout superhero, he's the guy that's like, okay, you cross him? Well, I rip your head off, and then I move on to the next guy." Dwayne Johnson had previously indicated that Black Adam could film in 2019, if all goes well. That may be reaching a bit, as he's currently filming Jungle Cruise, then he's off to do the Fast and Furious spin-off Hobbs and Shaw before making room for Jumanji 3 and his original thriller Red Notice. It seems highly unlikely that he could squeeze a major superhero movie in there as well. Black Adam doesn't currently have a release date but Aquaman will be the next DC movie to hit theaters this December, followed by Shazam in April 2019. This news was initially reported by Collider.